As we've shown you, the PlayStation Vita has some handy apps. And now, following the Asia Game Show, it's got two more. Testing Out Vita&apos;s Near. In the Back of a Car. 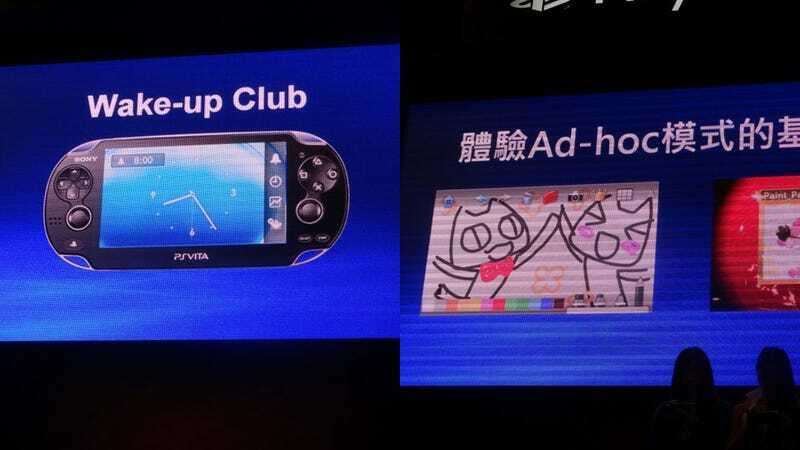 Unveiled at the Hong Kong show, which wound up yesterday, were new apps Wake-up Club and Picture Park. Wake-up Club is an alarm clock service, which runs in the background and can interrupt your usage/gaming if you want it to. Picture Park, meanwhile, looks to be a fancier version of the Nintendo DS' Pictochat, letting you draw images on the Vita's touch screen then send it to other people. They'll be out sometime in early 2012.